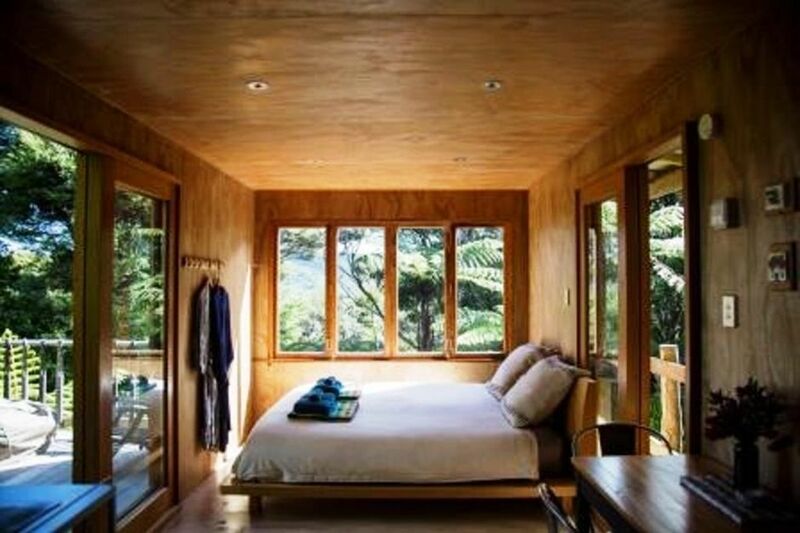 Le Cabanon is a purpose built chalet, designed with nature based peace and exclusivity in mind.Nestled under the pohutukawa trees, it is luxurious, eco-sensitive and romantic. Private views of Tryphena Harbour and the setting sun from the spacious deck. We have furnished the chalet with comfortable, functional and unique furniture. Birds will greet you, and if you are lucky the seemingly tame and astonishingly dexterous fantails will amuse you while you are relaxing in the giant bean bags on the front deck. Le Cabanon has all the facilities you require including a fabulous shower, flush toilet, crisp linen and luxurious towels, cooking and eating equi[ment including a gas hob and barbeque, tea, coffee and milk. Explore the beautiful Great Barrier (Aotea) Island or just relax on the deck or in the nearby garden. The Cabin is located 500 metres up a steep (at times) track which ensures a private experience. Although some 2 wheel drive vehicles can achieve the drive we recommend 4 wheel drive vehicles. These can be hired on island. 4 wheel drive vehicles are recommended to negotiate the fairly steep driveway. In saying this many 2 wheel cars do negotiate it with no trouble. As the chalet is off the grid we have to say NO to hairdryers and other high wattage appliances. Me and my boyfriend had a very lovely stay at Le Cabanon. Perfect privacy and all the basic necessities plus some luxury. Loved especially the views and bathrobes:) There were good detailed info about the stay at the place and tips for the visit on the Island which made our stay very pleasant. Le Cabanon is amazing place to view the stars at evening from the balcony or even from the comfiness of the bed (one of the best beds on our travels!). Made some delicious food with the grill with quality ingredients found at the near food store and enjoyed the nature around the island conveniently as tramping tracks were easy to access with a car. Would have wanted to stay longer. Lovely cabin in a great location, had everything we needed for the 3 nights we stays, would definitely recommend! This place feels remote and is super quiet, but not far from shops and places to eat. A very nice experience.